Police investigate at the scene of the fatal accident on Friday night. MIRI: A 33-year-old lecturer Saloma Emang, was killed after she was involved in a two-car accident in Jalan Bypass here at 8.30pm on Friday. She succumbed to her injuries while receiving treatment at Miri Hospital. State Traffic Investigation and Enforcement chief Supt Alexson Naga Chabu when contacted yesterday confirmed the case. 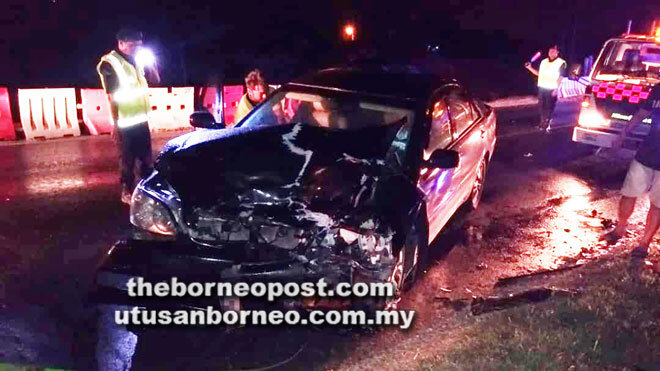 He said that initial investigation found that the victim who was driving from the direction of Miri Airport heading towards Pujut had collided head-on with another car driven by a man coming from Pujut to Miri Airport. “The man’s car had veered into the opposite direction causing it to crash head-on with the victim’s car. “The impact resulted in the victim sustaining serious injuries. She was rushed to Miri Hospital in an ambulance,” Alexson said. The victim however succumbed to her injuries while receiving treatment, while the other driver escaped with light injuries. Police are investigating the case under Section 41(1) of the Road Transport Act 1987. The post Lecturer succumbs to injuries after head-on collision appeared first on Borneo Post Online.